Cast: Patton Oswalt, Lou Romano, Ian Holm, Brian Dennehy, Peter O'Toole, Janeane Garofalo, Will Arnett, John Ratzenberger. Story: Rat in the kitchen. I remember seeing the first trailer for Ratatouille in the cinema well over a year ago, and as a result I was expecting it to be Pixar's first flop - but I was spectacularly wrong. 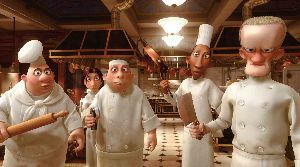 Ratatouille is magnificent. You'd never have got this story through a board meeting. A rat in Paris likes to cook, teams up with a kitchen hand to make sumptuous food - god I can hardly bear to type it. However, somewhere around the twenty minute mark I found myself converted from hardened cynic to rat addict, completely entranced and wholly under the little rodent's spell. OK, so I'm a fully paid-up member of the animated movie fan club but even so, I can't see anyone walking out and thinking, "meh" - I predict a cinema of smiles and a theatre of thumbs up - though perhaps the younger kids may not quite gel with it in the same way they did with the Shreks. As you would expect, the technical side of things is flawless. The humans and rodents interact beautifully, both given a cartoony look with dominant eyes and outsized features. The voices are all unknowns, which is both brave and surprisingly effective ... no hang on ... they're not unknowns! Look at that cast list: Ian Holm, Brian Dennehy, Peter O'Toole, Janeane Garofalo, Will Arnett, John Ratzenberger - good grief, I didn't recognise a single one of them while I was watching, I must have been properly captivated by the movie. The two main characters - culinary rat Remy and clumsy dogsbody Linguini - are genuine unknowns, yet they're both easily as good as their high profile colleagues. How peculiar that they paid top players to do the rest of the roles and didn't publicise them ... even more peculiar that it seems to have worked. Most critics came down hard on Pixar's last masterpiece Cars, but they were wrong about that, and if you see any negative reviews about Ratatouille you can ignore them too. Each movie Pixar has made has been a contender for the most enjoyable film of its year and Ratatouille is no exception. Ratatouille was released in the UK on 12th October 2007. Utterly charming and totally entertaining. I had a smile from ear to ear.